An evergreen Tree growing to 45m at a fast rate. It is hardy to zone 10. It is in leaf all year, in flower from July to August. 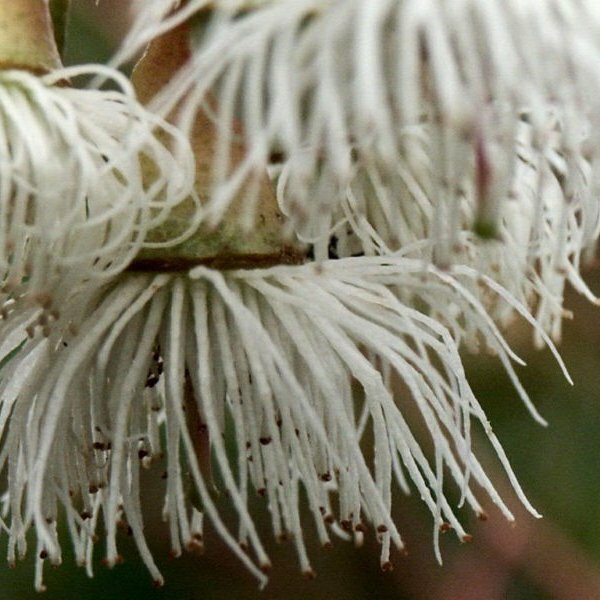 The flowers are hermaphrodite (have both male and female organs) and are pollinated by Bees. The plant prefers light (sandy), medium (loamy) and heavy (clay) soils, requires well-drained soil and can grow in nutritionally poor soil. The plant prefers acid, neutral and basic (alkaline) soils. It cannot grow in the shade. It requires dry moist or wet soil and can tolerate drought. Eucalyptus citriodora, or Lemon Scented Gum, is a stately evergreen tree native to Queensland, Australia. 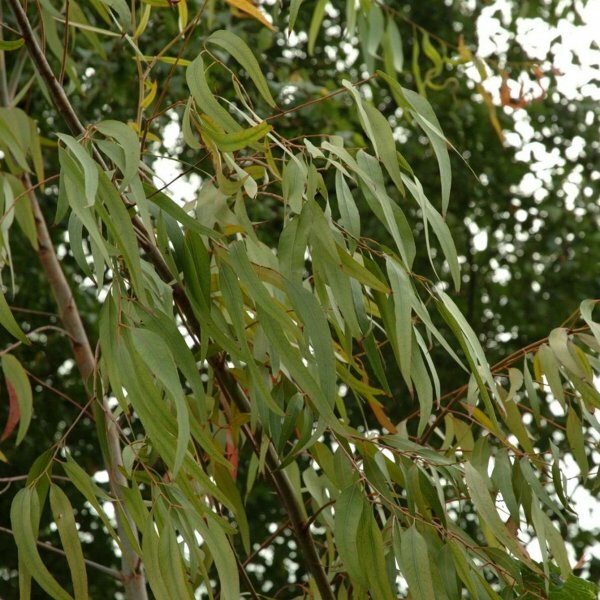 The trees have 2 forms of leaves, the juvenile leaves being lanceolate up to 6 inches (15 cm) long with a rough sandpapery feel. The adult leaves are known as phyllodes and are more highly drought adapted. In fact, phyllodes do not have a traditional leaf lamina--instead the green leaf blade, in a developmental sense, is an outgrowth of the petiole. Both sets of leaves have a strong lemony scent when crushed. The trunks and branches of this species are powdery white to pinkish and the trunks are usually very straight. 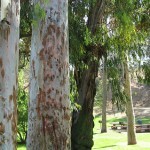 They are a very popular tree in California and Arizona. 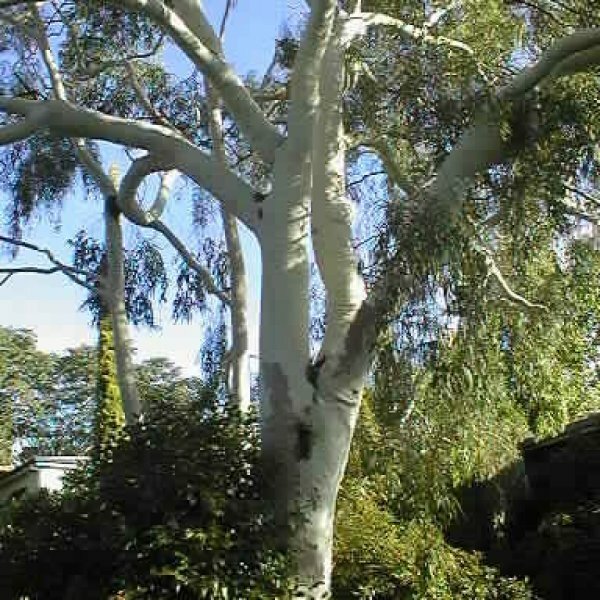 While this species get very big in nature, its size is easily control with selective pruning and container size when grown in the greenhouse setting. Other uses: A lemon-scented essential oil is obtained from the leaves. It is used, especially in perfumery but also medicinally. The leaves yield between 0.5 to 2.0% essential oil. This species is a very rich source of citronella, which is much used in the perfumery industry. Some batches of the essential oil contain 98% citronella. Glabrous leaves may contain oil with 65.5% citronellal, 12.2% citronellol, and 3.6% isopulegol; hairy leaves contain more oil with 86.6- 90.1% citronellal, 4.6 - 6.0% citronellol, and 0.7 - 0.8% isopulegol, 1-pinene, b-pinene, and isovaleric aldehyde are also recovered. 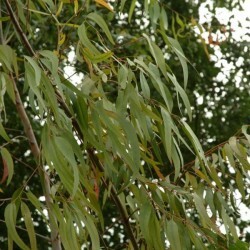 The leaves and the essential oil are used as an insect repellent. Germination 1. 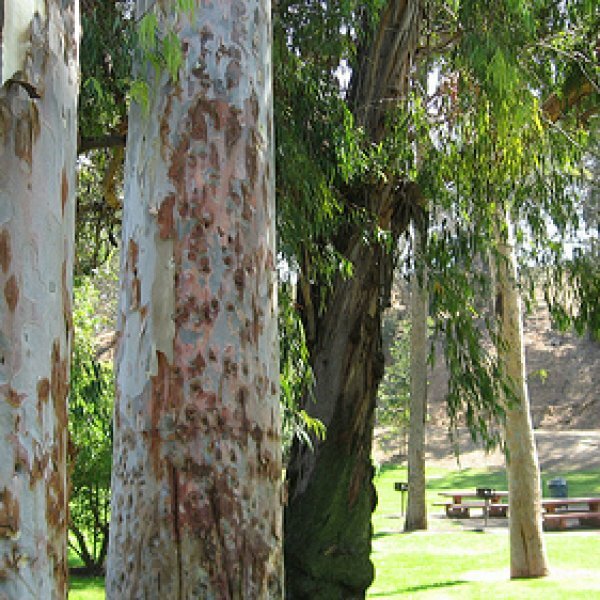 Place a single paper towel on a flat surface and spread the eucalyptus seeds onto the towel in an even layer. Place another paper towel on top of the seeds and then place the towel and seeds onto a plastic sandwich bag. Pour 2 tablespoons of water into the bag and seal it up. 2. Place the bag into a refrigerator that holds a temperature between 35F (+2°C) and 40F (+4°C) degrees. Keep the seeds in the refrigerator between one and two months. 3. Fill a seed tray with a potting soil until the compartments are 3/4 full. Place one to two eucalyptus seeds into each compartment and then sprinkle the tops of the seeds with soil until the dirt reaches the top of the seed tray. 4. Water the soil thoroughly with plain tap water. 5. Place the seed tray in a location that receives direct sunlight, and that has a temperature of between 60 and 65 degrees Fahrenheit. Keep the seeds moist and they should germinate in about one to two weeks.